CARMEL, Ind. -- One person suffered minor injuries after a car crashed into two garages Saturday evening. 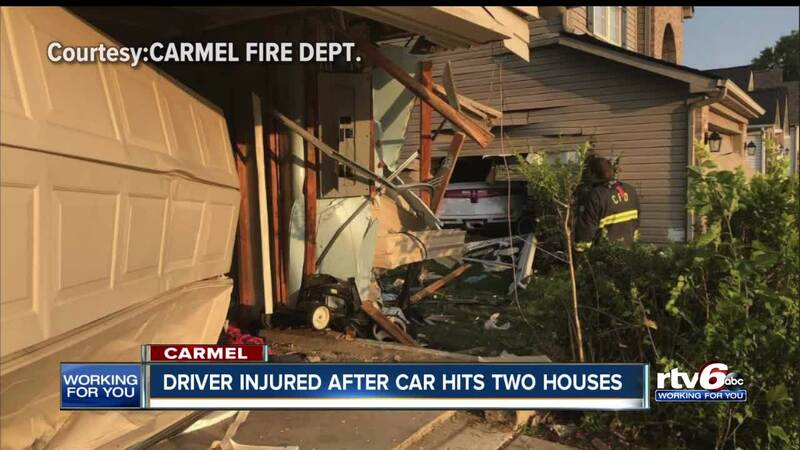 Emergency responders were called to the scene in the 13000 block of Forum Meadows Drive just before 8 p.m.
Carmel Fire Department says the car hit the garage door and hit another garage before stopping. The driver, had minor injuries and was taken to St. Vincent's Hospital. Nicole Zollinger-Muench, 44, was arrested and preliminarily charged with operating while intoxicated. Police said Zollinger-Muench told them her flip-flop got stuck on the accelerator and couldn’t stop. Both homeowners had to evacuate their houses until they were evaluated by engineers. No one in either house was injured.